Dundee United have been fined £13,500 for crowd disturbances and a pitch invasion during their Europa League tie against Dinamo Moscow in August. The Scottish Premier League club say they will not be appealing against the decision by governing body Uefa. United chairman Stephen Thompson said: "It is extremely disappointing that the actions of a few individuals have imposed this financial penalty." A punch-up between rivals fans began just after the start of the game. "We are working alongside Tayside Police to identify the individuals involved in the crowd disturbance," added Thompson. "And the person who encroached on the pitch has already been notified of a life-time ban." 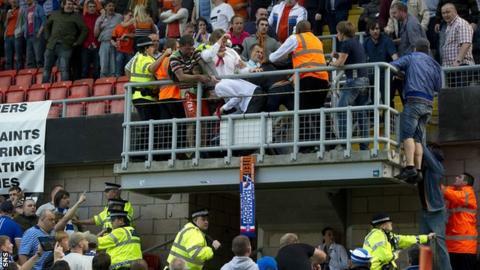 Fans clashed in the Jim McLean Fair Play Stand when supporters from the visiting section climbed up into the upper tier, which housed United fans. Tayside Police said three fans had been arrested and seven ejected from the ground on the night. United and Dinamo drew the first leg 2-2 at Tannadice, but the Russians won the return game 5-0 to progress in the tournament.